November - No General Meeting - Happy Thanksgiving!! Records of the chartering and establishment of the Montgomery County Retired Teachers Association Chapter are not available. The minutes of the annual meeting, April 27, 1950 is the first formal record. The 25th Anniversary of the MCRTA Chapter was celebrated in 1972, so the beginning of the MCRTA began around 1947. MCRTA is representative of 18 school districts in Montgomery County. At the MCRTA Board meeting, July 26, 1950 it was decided to send a form letter to every retired teacher in Montgomery County inviting them to join the chapter. Local membership cards were printed and dues were set at $.50 per year. In 1974, dues were raised to $2 and now are $8. At the general meeting on October 29, 1956 it was decided to change the name of the local chapter to Western District Chapter of the ORTA. The organization included Auglaize, Darke, Greene, Mercer, Miami, Montgomery and Shelby counties. 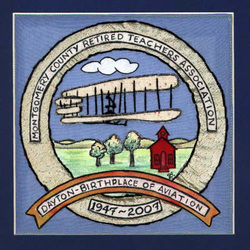 The 1971 revision of the constitution and by-laws changed the name of the local chapter to the Montgomery County Chapter of the Ohio Retired Teachers Association. Beginning in 1950, semi-annual meetings were scheduled in April and October. In 1977, four general meetings were scheduled -- March, May, September and October. From 1978 until 1981 there were five meetings. In 1981 , a sixth meeting was added. We meet in March, April, May, September, October and December. A picnic is planned for August 19, 2007 to celebrate ORTA's 60th anniversary and retirees. The Shoe Fund was established in 1984. Members' donations have provided shoes for thousand of needy students in Dayton and Montgomery County schools. In 1991, Bob Daniszewski designed and built a Mitten Tree and each December members decorate it with mittens, gloves, hats, scarves, socks and stuffed toys for area needy children.